Augmented Vs. 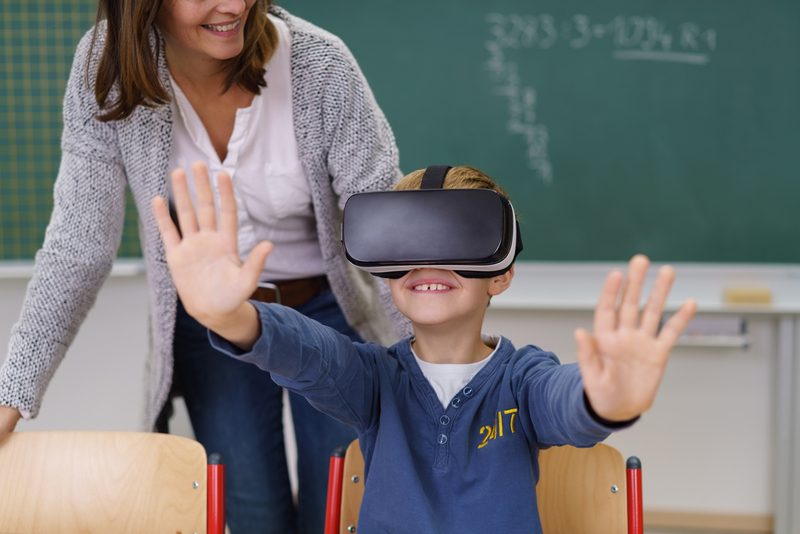 Virtual Reality: Which Will Transform Education? | Clarity Innovations, Inc.
Augmented reality and virtual reality are the conjoined twins of new technology: you can’t seem to talk about one without talking about the other. But which is the best fit for education? So what is the difference between virtual reality and augmented reality? Firstly, virtual reality (VR) is an artificial environment that immerses the user so that he or she feels like they are experiencing a simulation. An example would be to transport the user to a soccer field, a famous landmark, or a busy street in New York City. The experience is usually delivered through a head-mounted goggles and/or hand-held controllers. The dedicated immersive virtual reality device market is expected to reach $407.51 million by the end of the year. Augmented reality (AR), on the other hand (or face in the case of virtual reality goggles) layers computer-generated enhancements atop an existing reality to make interactions more "married." For example, you might see a virtual figure guiding you on the actual sidewalk for a AR tour of a city. Augmented reality is being used more and more in smart phones and tablets, and can be seen in today’s museums or even in industries such as architecture, medicine, and construction. The dedicated AR device market is expected to reach $659.98 million by the end of the year. Perhaps one of the most well-known applications of augmented reality is with the NFL’s use of the technology: that “first down” line during televised football games in a marriage between actuality and augmentation. And remember Pokémon Go? It was all the rage in the summer of 2016. Parents gave their blessing as it got tech-loving children out-of-doors interacting with the real world. This was due to a historic union of branding and augmented reality. It put AR on the map as a potential educational tool, making $1.6 million per day during its first week of release. Numerous studies have shown the strengths of both virtual and augmented reality use in the classroom. One of the most significant strengths is that they change the role of the teacher from the deliverer of knowledge into a facilitator, and—due to their visual and experiential nature—can foster active learning while helping students to grasp abstract knowledge. The immersive nature of both augmented and virtual reality can also help block out distractions, resulting in more focus and better concentration. For visual learners and individuals with learning challenges, VR and AR provide an alternative medium to meet their needs. Another benefit of this technology is the opportunity for learners to better "feel" a lesson—including such difficult emotions as stress, anxiety, conflict and confusion—so that they are more prepared for these experiences in the real world. For example, medical students can experience the psychological challenges of life at a hospital. Air traffic controllers, policemen and firemen can participate in realistic online training experiences that put them face-to-face with disasters. It’s easy to see how these experiences could translate to the classroom. In theory, AR offers the best learning experience due to its relatively low cost and ability to work with existing technology. And unlike virtual reality, AR does not obscure the user’s field of vision because it simply overlays digital content on top of the surrounding environment. In this way, AR offers more freedom of movement compared to virtual reality, which immerses the user in a world completely isolated from the surrounding environment. That said, virtual reality wins in terms of immersion and adaptability to various learning styles, which translates to more student engagement. It can turn traditionally dull classroom activities, such as reading aloud from a history book, into something students actively explore and discover Mount Everest, Tokyo, or the Eiffel Tower in 3D, rather than passively absorb two-dimensionally. The advantage of equity here can't be overstated: we're able to transport students like never before without a passport and funding. Certain abstract subjects, such as math, could also be improved through the visualization that VR provides. And, in the long run, VR could save money on such common classroom expenses as field trips and lab equipment. Medical students, for instance, can work with virtual cadavers that provide identical, more efficient, and less costly learning experience for all students. Electrical engineering students can forgo the risk of electrocution while learning basic methods and properties. And while AR is still evolving, the technology has already helped engage students in a number of areas, such as astronomy and anatomy, for example. The University of Nebraska Medical Center has even begun construction on a $118.9 million virtual and augmented reality center. “Learners do best by having experience, whether it’s learning how to play a sport, a musical instrument or, in my case, do cardiac surgery,” says UNMC Chancellor Dr. Jeffrey Gold of the facility. Though AR is ahead by a nose, technology moves so fast that it’s anyone’s guess which will ultimately win a place in the pantheon of indispensible classroom tools. Undeniably, both VR and AR offer the potential for a heightened level of student engagement. This prospect should not only fill educators with a sense of excitement, but with a sense of opportunity to implement the technology today to improve the way that tomorrow’s students learn.